More than 90% of people worldwide live in areas exceeding the WHO Guideline for healthy air. More than half live in areas that do not even meet WHO’s least-stringent interim target for air quality. We track air pollution exposures for three main pollutants: fine particles (PM2.5), ozone, and household air pollution. Scroll down to learn about all three or click on the image below to go directly to an individual pollutant. Fine particle air pollution, referred to as ambient or outdoor PM2.5, comes from vehicle emissions, coal-burning power plants, industrial emissions, household energy use, and windblown dust, among other sources. Long-term exposure to high levels of PM2.5 is harmful to your health. The concentration of PM2.5 in air is measured in micrograms of particles per cubic meter of air, or µg/m3. Exposure to PM2.5 for each country is estimated as the population-weighted annual average concentration, a concentration that reflects where most people live. Scroll over or tap to see the concentration in your country. Click on either the colored boxes or on the ranges to select and de-select different concentration ranges. To download the map, click on the black arrow at the upper right corner. The sources responsible for PM2.5 pollution vary within and between countries and regions. others continue or increase their reliance on coal and other major contributors to air pollution. The WHO Air Quality Guideline is set at a level intended to be protective of human health. There are also three Interim Targets (ITs), which are intended as intermediate goals for countries with high air pollution levels. 54% lived in areas exceeding Interim Target 1 (35 µg/m3). 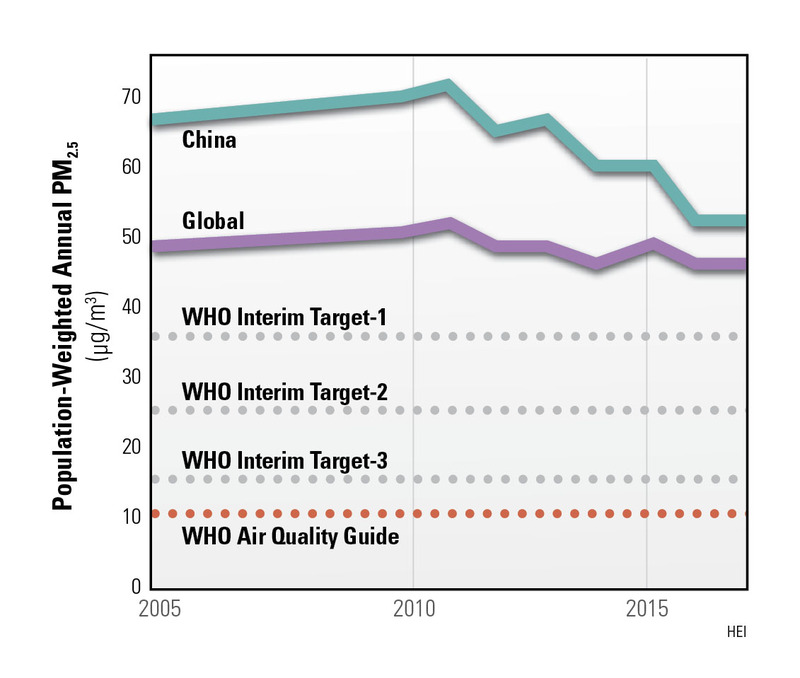 The largest improvements in PM2.5 levels relative to the WHO Guideline of 10 µg/m3 (left column below) have been experienced by only a handful of countries -- Russia, the European Union, Japan, Brazil, and the United States. 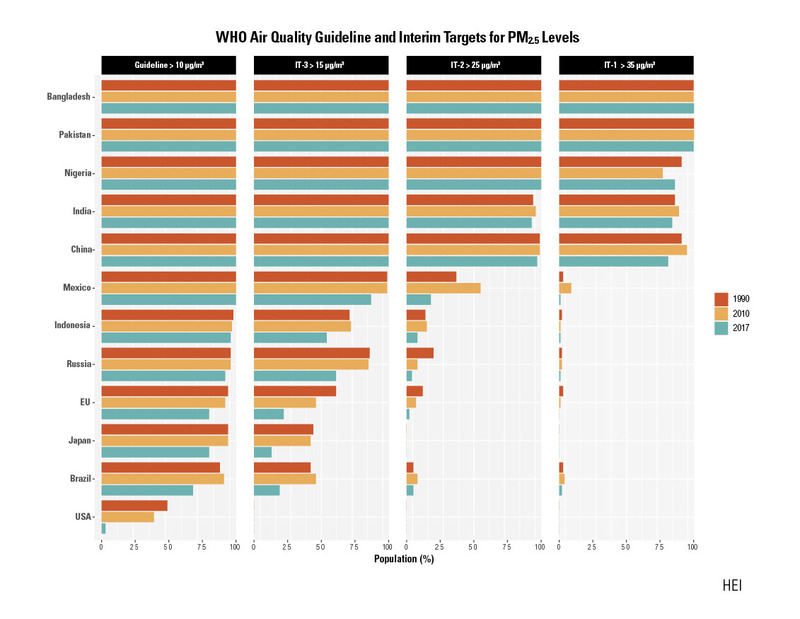 Large percentages of the populations of Bangladesh, Pakistan, Nigeria, India, and China continue to live in areas with levels of PM2.5 that remain above the first WHO Interim Target of 35 µg/m3 (right column below). Less-developed countries experience PM2.5 levels that are four to five times higher than those of more developed countries. 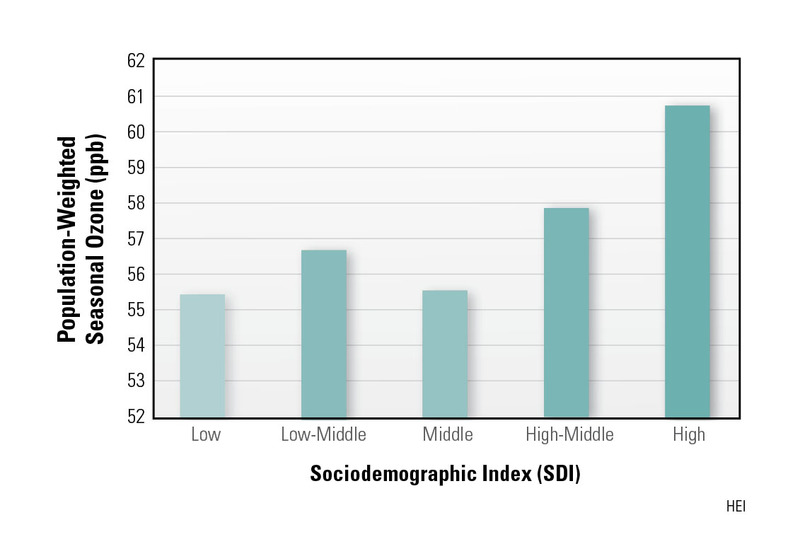 The Global Burden of Disease project uses the socio-demographic index as the measure of development reflecting income levels, educational attainment, and fertility rates. In China, PM2.5. pollution has dropped markedly in recent years, after extensive government efforts to control emissions from power plants, traffic, household burning of coal, and other sources. The population-weighted annual average concentrations, a measure of population exposure, decreased from about 65 µg/m3 in 2005 to about 52 µg/m3 in 2017. However, challenges remain. The current concentrations of PM2.5 in China still exceeds WHO’s least-stringent air quality interim target of 35 µg/m3. Watch how levels of an important precursor to PM2.5 ― sulfur dioxide ― have dramatically decreased in China from 2005 to 2017 in this animation from NASA. Coal-fired power plants are an important source of sulfur dioxide. At ground level, where people live and breathe, ozone is an irritant gas that can have harmful effects on human health. Most ozone is formed in the presence of sunlight from precursor chemicals, such as nitrogen oxides and volatile organic compounds, emitted by various industrial processes, power plants, motor vehicles, and other sources. Ozone concentrations are measured in units of parts per billion (ppb). Exposure to ozone for each country is estimated as the population-weighted seasonal (8-hour maximum) concentration. Ozone pollution is a continuing challenge in more-developed countries and is increasing in less-developed areas, posing new air quality concerns. The world’s more-developed regions have the highest ozone exposures, despite extensive and successful air quality control for ozone-related emissions in many of these countries. In countries at middle levels of development with rapidly growing economies, population-weighted ozone concentrations have been increasing slowly but steadily because of warming temperatures and increased emissions of ozone precursors with industrialization. In many places, people burn solid fuels such as coal, wood, charcoal, dung, and other forms of biomass, such as crop waste, to cook food and to heat and light their homes. This practice can generate high concentrations of PM2.5 and other pollutants in and around the home. Like fine particles in ambient air, fine particles from household air pollution are also harmful to health. 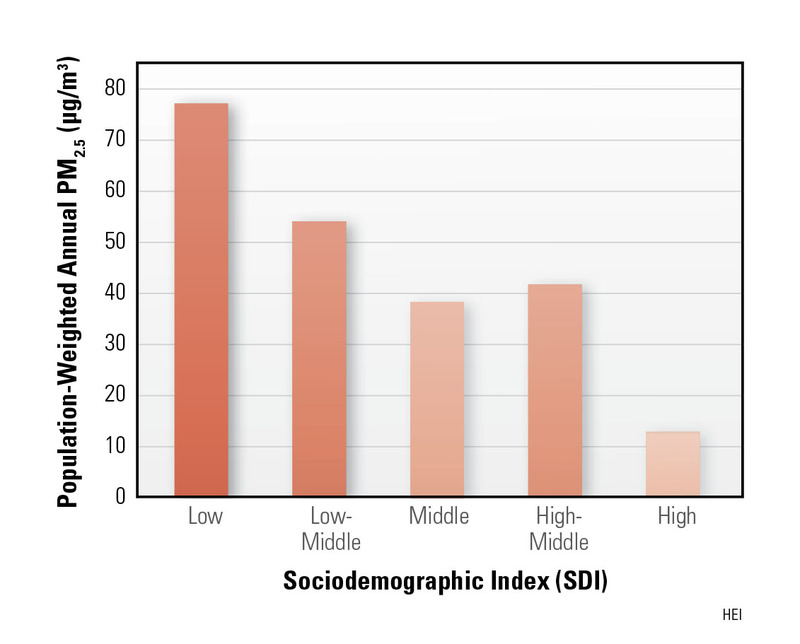 In the Global Burden of Disease (GBD) project, exposure to household air pollution is presented as the percentage of the population in a country burning solid fuel for cooking in the home. Scroll or tap to see the proportion in your country. Click on either the colored boxes or on the ranges to select and de-select different concentration ranges. To download the map, click on the black arrow at the upper right corner. Globally the proportion of households relying on solid fuels for cooking dropped from about 57% in 2005 to 47% in 2017. 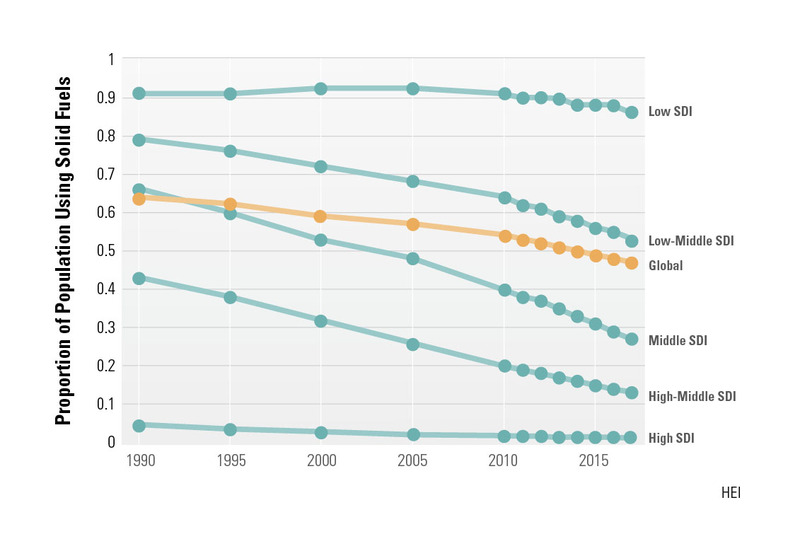 This trend has been driven largely by changes in countries at the mid-levels of development (low-middle, middle, and high-middle development levels). Although rates are coming down in many countries of the world, the number of people potentially exposed may remain the same or even increase as populations continue to grow.